A few months ago there was a dust-up online regarding adults who like reading YA literature. Apparently this twisted the knickers of some critics, who muttered about the quality and (supposed) lack of depth in YA literature. Reading the Harry Potter books, anything by John Green, and the like was suddenly a shameful thing for adults to be doing, though I guess it was OK to read chick-lit or light beach-escape reading as long as it was written with grown-ups in mind. Far better writers than I have addressed this issue and extolled the fine writing and substance to be found not only in YA but also chapter books and picture books. I can only say that I've had a very pleasant few months indulging in the habit of reading horse books, which took turns with other novels that would be more likely to pass muster with these critics. As a horse-crazy kid, of course, I did nothing but read horse books between the ages of 9 and 14. My local library helpfully labeled all its horse books with a little horse-head sticker on the spine, so you didn't even have to use the card catalog. I figured I'd probably read every horse book available in our library system and most of the ones ever written for the middle-grade/young adult crowd by the time I got to high school, but there were actually herds and herds of literary oaters out there that I'd never come across, and that's not even counting the hundreds of titles that kids in England enjoyed throughout the 1900s. Among these titles was a five-book series I stumbled upon in a vintage-items shop in late summer: The Timber Trail Riders. This series was published between 1963 and 1964, when I was still a very tiny person learning to talk, let alone read. The adventures of the Timber Trail Riders were published by Whitman Publishing Company of Racine, Wisconsin. Whitman Publishing Company became a subsidiary of Western Publishing in 1915 (Western later published the beloved Little Golden Books). The Whitman line included many mysteries and westerns; series based on characters such as Trixie Belden, Donna Parker, and Troy Nesbit; and many books based on popular TV shows and movies such as Lassie and various Walt Disney films. One aspect that intrigued me about these books was their obvious appeal to boys--three of the five stories featured boys as the main characters. 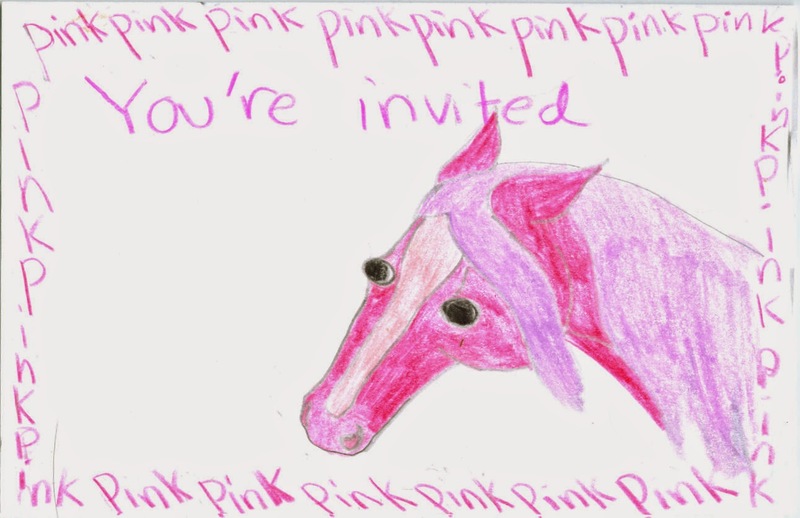 This might not have been remarkable back in the day, but among the connoisseurs of pony books (yes, there is such a thing, and we hold our heads high), there is concern about the pinkification of the horse world--is there too much emphasis on all that is pink, glittery, and princess-y? 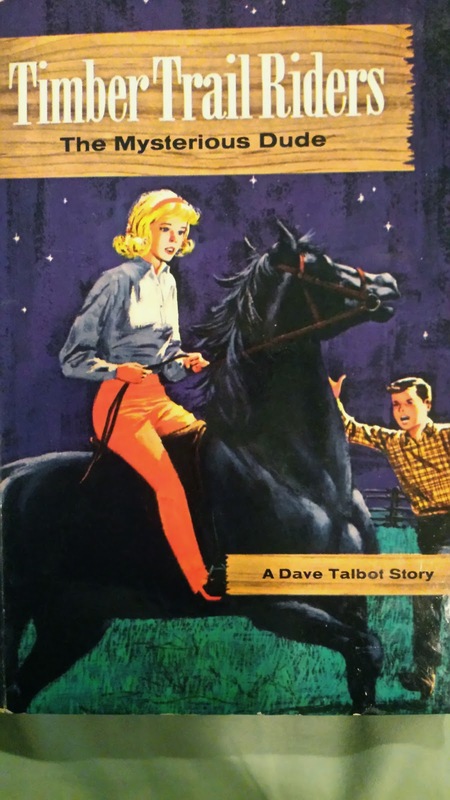 There was no shortage of boy-friendly horse stories when I was looking for books in the 1960s and early '70s, though. 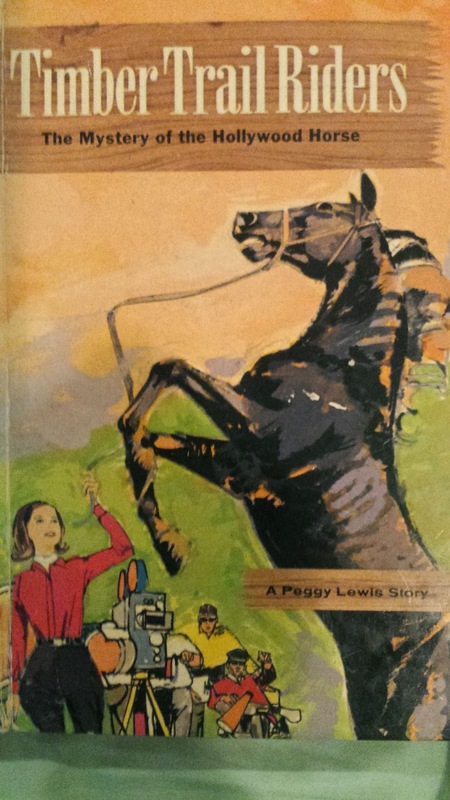 Marguerite Henry's books appealed to both boys and girls, as did the many volumes in Walter Farley's "Black Stallion" series. Most of these books had boys as the central human characters, but the horses figured so strongly in them, it wasn't off-putting to a horse-crazy girl reader. 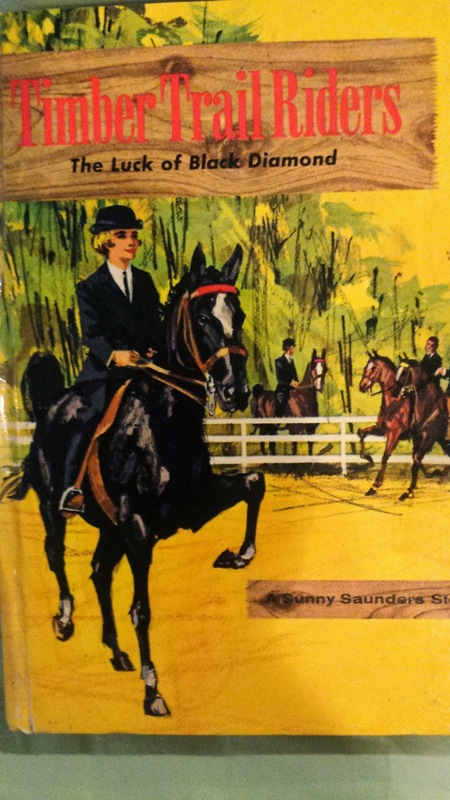 I read Henry's books over and over, though the Black Stallion books didn't grab me--I read a few of them and then left off when my mom signed me up for the World Famous Horse Story Library book club, which brought books from authors around the world to my doorstep. So when I sat down to read the Timber Trail Riders, I wondered if they'd have appealed to me when I was a kid, when just about all it took for me to like a book was the presence of a horse every few paragraphs. When I finished them, I knew for sure they wouldn't have been my cup of tea. Not because the writing is terrible--it's not scintillating prose, but it's up to the task for a simple, unadorned, straightforward action-adventure mystery, perhaps the sort of writing for teens that would be called "hi-lo" today (high interest/low reading level). One reason I wouldn't have liked them is the fact that they're mysteries. I hated mysteries as a child and I still don't like them. I had only one mystery book as a kid, and the only reason I read it again and again was because I knew how it ended. Something involving--wait for this--a false drawer in a desk! Unheard of! My childhood obsession with horses taxed the patience of many adults--an art teacher took credit off my grade because I painted too many horses, a great-uncle ridiculed my drawings because they were of "yet another horse," and I was praised mightily when I brought home a book from the library that wasn't about horses. But I can say only this to teachers and parents who fear that girls' horse obsessions will limit them in life: Stop worrying. Horses carry the young reader into all kinds of amazing worlds of imagination and history and fact. And I can see now that the types of books I like now are rooted in those horsy books I indulged in as a kid, so I was actually forming reading tastes while I was steeping myself in horse lore. Jill Crewe of Ruby Ferguson's "Jill" pony books and her stories set in a small village where everybody knows each other, life turns on small hinges, and there's lots of talking and humor? Well, Jill, meet Jane Austen. OK, So, What About the Books? As noted, there are five titles, all published in a two-year span. 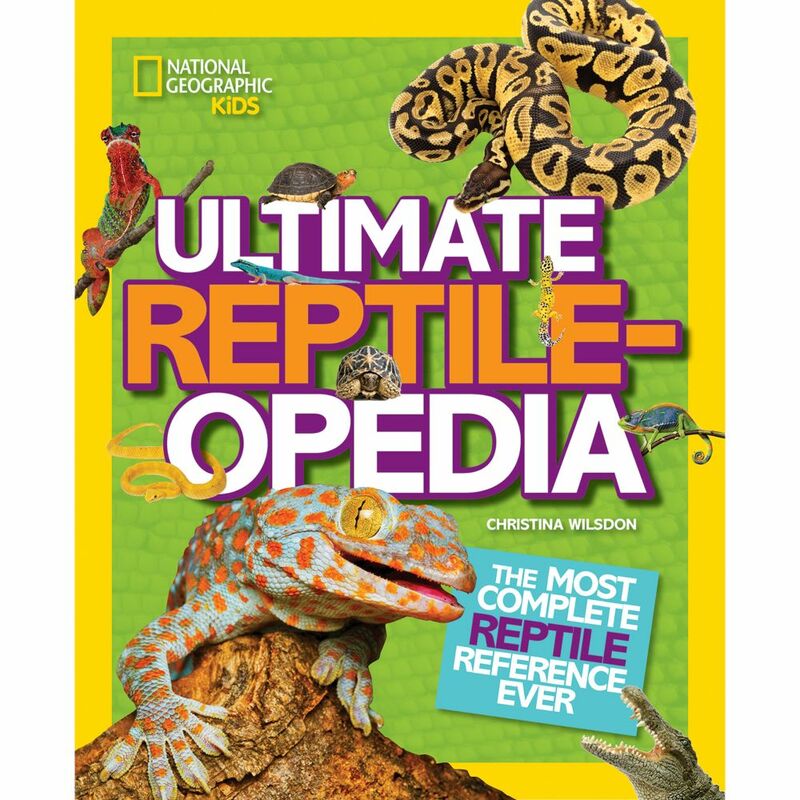 I have found very little about them on the internet and absolutely nothing about the author. Or authors? Was Michael Murray a pen name for several writers? A copyright-renewal page online notes only that Murray was a hired writer. Either Murray was a very fast writer, or he was actually two or three writers. I also wondered whether Whitman intended to continue the series. 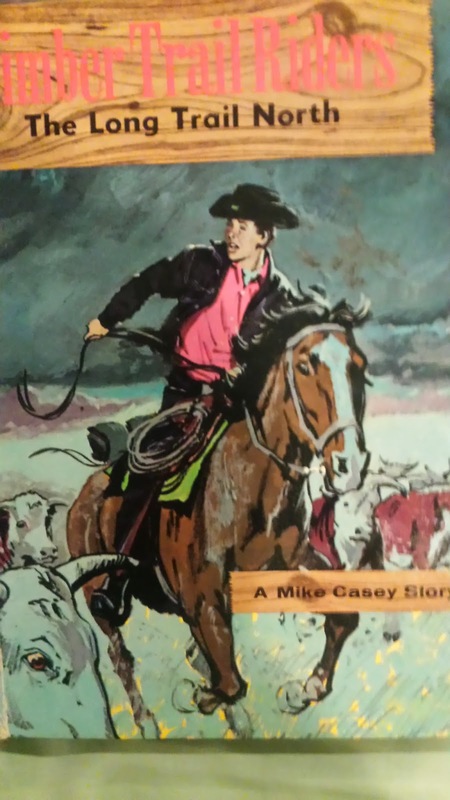 Each book's cover includes the title and a tagline featuring the main character's name: "A Mike Casey Story," "A Peggy Lewis Story," and the like. This billing makes me think they thought the series would take off and that the characters would become household names. What they have in common is a scheme used by authors from the Brothers Grimm to Roald Dahl and J. K. Rowling: get rid of the parents, and get rid of them quick! Fortunately for the parents of the assorted Timber Trail Riders, most of them are not stomped to death by an angry rhinoceros, blasted by an evil wizard lord, or otherwise dispatched. Typically, the kids simply get a marvelous opportunity to live away from their family for a month or two or even as long as a year and have thrilling adventures during that time. 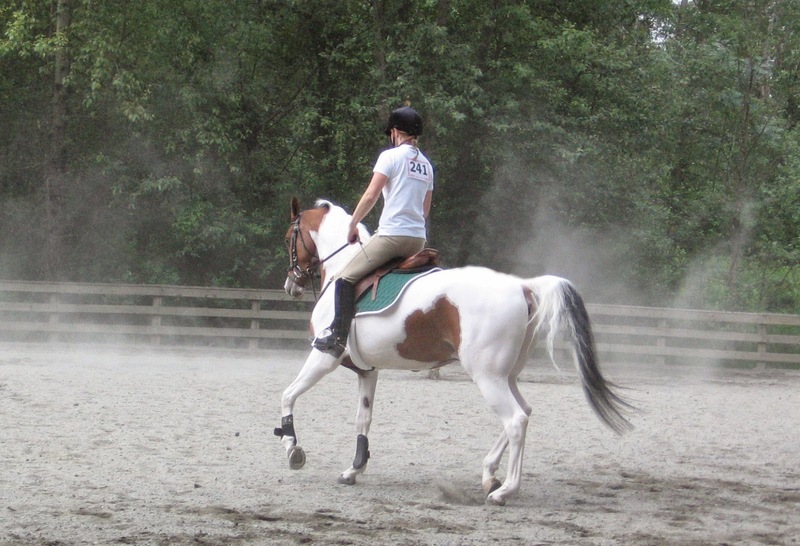 They also obtain horses or access to horses in ways that real kids can only dream of. Details below. Mike Casey and Danny Hall are 13-year-old boys who help out on an old-time cattle drive set in modern times. It's all part of a nostalgic whim of an Englishman who’s bought an old cattle ranch that other people wanted to turn into a game farm. Failing to obtain the ranch (spoiler alert), the bad guys try to sabotage the cattle drive. Little hiccups in the journey include a near drowning, a few stampedes, a steady loss of cattle, and a hostage situation in a ghost town. Dave Talbot, age 15, arrives in Chicago’s airport, dressed like a cowboy, and gets stared at a lot. 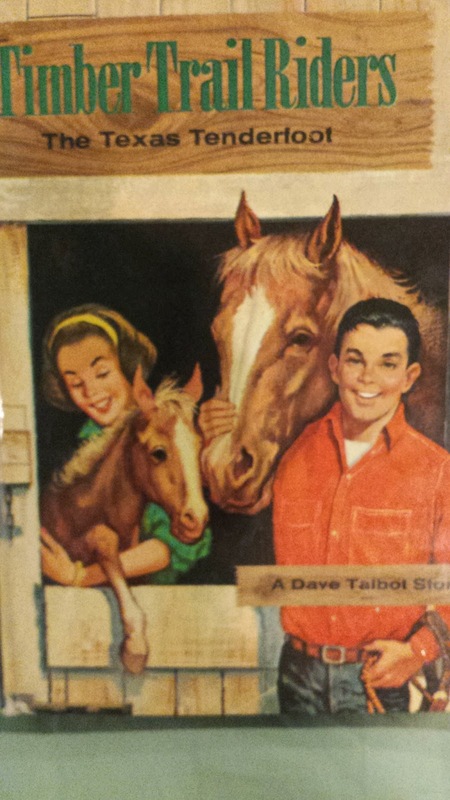 Dad is off for a year working in the oil industry and Mom is deceased, so Dave's going to stay with Dad’s old pal Colonel Dwyer who owns a big horse farm,. There he meets mysterious Lee Ann Burton, a poor little rich girl whose jet-setting parents are out of the picture. Long hair--and dyed, no less! Clearly bad news. Dave falls off a horse that Bo deliberately saddles improperly. Bo also lets valuable horses escape and tries to blame it on Dave, puts a burr under his saddle, and even attempts to burn down the stable. Dave ends up playing Sherlock Holmes and proving Bo's the culprit. In other news, Dad buys the brilliant horse Star Bright for Dave. There's also a show and party. The author of this book describes all the food lavishly. It will make you hungry. Sunny Saunders is a young teen who goes off to live with her aunt and grandmother for a few weeks in Colorado. Straightaway she is witness to the rescue of a cow that gets stuck in quicksand. Soon after she is given free use of a splendid black horse named Diamond, who is getting a month off from his job as a regular lesson horse—he will be hers alone. And then her uncle buys the horse to send home with Sunny, on the condition that she ride him and not neglect him. Which causes her to worry mightily about her magnanimous decision later on to let her friend ride the dependable horse in a show—her uncle has arrived for a surprise visit and when he sees that, he’ll hit the roof, won’t he? No, because at the last minute the other girl gets another lovely horse and all is well. This, the third book in the series, appears to have been written deliberately to cater to the tastes of many girl readers by focusing on relationships rather than adventures (a stereotype, for sure, but it probably resonates for a lot of women who like romances). After the quicksand bout, there are no other big adventures than a snarly dog that sometimes frightens the riders as they trot by a house. Teenager Peggy Lewis heads off to California to stay with her Aunt Paula for a month. Her aunt finesses a job for her at the stable of the trainer of Cinder, famous TV-star horse. She soon becomes friends with the girl who’s starring in Cinder’s next movie. There’s also a mysterious, grumpy older teen named Chuck who skulks around fretting about Cinder. They find lots of clues that point to somebody plotting to steal Cinder, and speculate a lot about it and whether or not to tell his owner for fear of being dismissed as worrywarts and fussbudgets. Guess what! Cinder gets stolen! Peggy, however, finds the horse thieves’ secret lair and spirits the horse out. The police show up and the bad guys are caught. This story stars a girl, and has more in the way of "relationship" angst than the adventure-oriented tales even though it has more hijinks than Sunny Saunders's story, but I did grow weary of all the hand-wringing and keeping things silent. Perhaps just my frustration with mysteries showing through. Or else knowing that the darn horse would be stolen and wanting to head this off at the pass. Dave Talbot reappears in this book. He arrives at the California dude ranch of one of his dad’s friends. Dave and that man’s son, Ron, were childhood friends. Ron's parents, Mr. and Mrs. Maynard, have to go East because Mrs. Maynard suffers from some mysterious illness, and she will get examinations there. Because they're gone, the ranch may have to be sold—but no! Ron and Dave will run it in their absence! Mystery shows up in the form of a slight girl with a “pale” voice who corrects everybody and recites information like a machine. She's annoying as heck and does irritating things like take horses out of the stable in the middle of the night. But I have to say she's a weird and interesting twist on your typical horse-book character. Unfortunately, unlike the tongue-in-cheek and fairly respectful portrayal of a Native American teenager in the series' first book, this title includes a Mexican cook who's a hot-headed, fiery South-of-the-Border stereotype straight out of central casting; she flings pots and pans and mutilated English right and left, and has a son who speaks like the mouse Speedy Gonzales from the "Bugs Bunny" cartoons. Kind of cringe-inducing. Later on, it's revealed that the Mysterious Dude-ette has a photographic memory. Not only that, but she turns out to have witnessed a crime and is hiding out at the ranch to escape a trio of men who are aiming to snuff her out, which they attempt to do during the big parade before the rodeo. I have to admit that by this time I was weary of action-adventure and mystery, and eager to get back to reading Molly Gloss's Falling from Horses, so I was rather racing through the books at the end. It did feel nicely subversive, however, to read books that the "no teen lit for adults" leagues would've chided me for perusing. What a great post. Yeah, it makes me crazy when people put down kid lit and/or YA books. Yeesh. I read oodles of animal books as a kid, but definitely went through a big horse phase. I loved the Black Stallion books and BLACK BEAUTY. 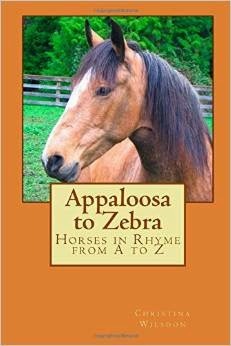 It was fun rereading all those books with my horse-crazy daughter when she was little!